The pending successor to No Child Left Behind that is the latest version of the reauthrized Elementary and Secondary Education Act (ESEA) will take federal pressure off states to use Common Core Standards. The latest bill, known as the Every Child Achieves Act (ECAA), was unanimously approved by the Senate Health, Education, Labor and Pension Committee and appears to have a good chance of approval by both houses. It does not incentivize states into adopting CCS. Committee chairman Senator Lamar Alexander (R) described it this way. … our proposal would end federal test-based accountability and restore state and local responsibility for creating systems holding schools and teachers accountable. State accountability systems must meet limited federal guidelines, including challenging academic standards for all students, but the federal government is prohibited from determining or approving state standards or even incentivizing states into adopting specific standards. In other words, whether a state adopts Common Core is entirely that state’s decision. This transfer of responsibility is why we believe our proposal will result in fewer and more appropriate tests. Our proposal allows, but does not require, states to develop and implement teacher evaluation systems that link student achievement to teacher performance. States will be allowed to use federal funds to implement evaluations the way they see fit. Without knowing more details, it’s difficult to know if there will be much pressure for states to establish and maintain high academic standards. How individual states react may be at least partly determined by how much pressure they feel from teacher unions and parents, many of whom have opposed CCS implementation. Jennifer Rubin sees a compromise that partially placates several groups..
… The president will get NCLB reauthorized, conservatives will make sure the feds’ role is properly restricted, conservative activists can chalk up a win and backers of high standards can disentangle that issue from NCLB. Jennifer Rubin, “A big legislative win on education”, Washington Post, April 24, 2015. Amid the controversy of how Common Core Standards are changing American K-12 math education, engineering professor Barbara Oakley argues that the value of memorization and practice continues to be downplayed. Common Core Standards “propose that in mathematics, students should gain equal facility in conceptual understanding, procedural skills and fluency, and application”. But implementation of CCS does not always follow those guidelines. The devil, of course, lies in the details of implementation. In the current educational climate, memorization and repetition in the STEM disciplines (as opposed to in the study of language or music), are often seen as demeaning and a waste of time for students and teachers alike. Many teachers have long been taught that conceptual understanding in STEM trumps everything else. And indeed, it’s easier for teachers to induce students to discuss a mathematical subject (which, if done properly, can do much to help promote understanding) than it is for that teacher to tediously grade math homework. What this all means is that, despite the fact that procedural skills and fluency, along with application, are supposed to be given equal emphasis with conceptual understanding, all too often it doesn’t happen. Imparting a conceptual understanding reigns supreme—especially during precious class time. I’ve read similar reports about how CCS continues to prioritize understanding at the expense of fluency. My experience several years ago was that teachers used to focus heavily on understanding, and I was told not to be concerned when my child had not mastered basic math facts because it was more important that she understand the concepts. Meanwhile she was falling behind in all aspects of learning. Is this still common? Explaining and discussing alone do not lead to full understanding and mastery. Chunking is important in analyzing and reacting to new learning situations. Gifted students and experts are often able to quickly reason their way into algorithms when solving math problems, arguably because of their deep understanding. But I don’t think most students find that to be a good approach in the typical learning process, as it slows them down as they are practicing to gain both fluency and understanding. On the other hand, I’m sure many students simply memorize with no understanding, thereby failing to build the foundation for later math success. Of course both understanding and fluency are important, and in the real world the critical questions are usually: Can you do it? Can you do it quickly? Barabara Oakley, “How I Rewired My Brain to Become Fluent in Math”, Nautilus, October 2, 2014. E. D. Hirsch, Jr. points out the relevance of these myths today, with the nationwide embrace of Common Core Standards that comes after the failure of No Child Left Behind reform. Ms. Christodoulou’s book indirectly explains these tragic, unintended consequences of NCLB, especially the poor results in reading. It was primarily the way that educators responded to the accountability provisions of NCLB that induced the failure. American educators, dutifully following the seven myths, regard reading as a skill that could be employed without relevant knowledge; in preparation for the tests, they spent many wasted school days on ad hoc content and instruction in “strategies.” If educators had been less captivated by anti-knowledge myths, they could have met the requirements of NCLB, and made adequate yearly progress for all groups. The failure was not in the law but in the myths. While Hirsch focuses most on reading skills and how CCS employ ‘the same superficial, content-indifferent activities, given new labels like “text complexity” and “reading strategies”‘, the entire list of myths is in play to doom the latest reform efforts. … If the Common Core standards fail as NCLB did, it will not be because the standards themselves are defective. It will be because our schools are completely dominated by the seven myths analyzed by Daisy Christodoulou…. Despite some rhetoric to the contrary, CCS implementation continues the educational establishment’s crusade against “knowing things” and “being taught things”. Instead, in accordance with the seven myths it downplays outside knowledge and encourages a “discovery-oriented” approach instead of direct instruction. E. D. Hirsch, Jr., “A Game-Changing Education Book from England”, Huffington Post, 06/27/2013. In New York, the rushed implementation of Common Core Standards combined with the new method of evaluating teachers have produced bizarre results that seem to offer no value in the effort to improve schools. In Scarsdale, regarded as one of the best school systems in the country, no teacher has been rated “highly effective” in classroom observations. It is the only district in the Lower Hudson Valley with that strict an evaluation. In Pleasantville, 99 percent of the teachers are rated as “highly effective” in the same category. “Saying 99 percent of your teachers are highly effective is laughable,” said Charlotte Danielson, a Princeton, New Jersey-based educational consultant who has advised state education departments around the country. Danielson’s model for evaluating teachers via classroom observations, Framework for Teaching, is one of the best-known models in the country and believed to be the basis for New York’s evaluation system. The new method for evaluating teachers is as flawed as the old method. The fact that 80 percent of the evaluation is based on local measures can inject a lot of subjectivity into the process, critics say. A look at the teacher evaluation data by the state Education Department shows that districts have the most leeway in the classroom observation portion of the rubric, which accounts for 60 percent of the evaluation. Administrators feel they must game the system to protect their teachers. “It is possible under the HEDI scoring band (which categorizes teachers as “highly effective,” “effective,” “developing” and “ineffective”) to be rated effective in all three areas and yet end up as developing,” Fox-Alter said, adding that she understood Danielson’s concern. “Danielson has said that teachers should live in “effective” and only visit “highly effective’,” said Fox-Alter, president of the Southern Westchester Chief School Administrators. But adhering to that philosophy might put her teachers in jeopardy, she said. The use of tests to measure teacher effectiveness is not without controversy, but as usual our public schools have compounded the problematic aspects with their sloppy implementation. The result is a thorny mess that falls short of achieving previously stated goals. Swapna Venugopal Ramaswamy, “Teacher evaluations: Subjective data skew state results”, lohud.com, September 15, 2014. Passing rates for Common Core New York state tests were selected so that they would match SAT college readiness rates. Principal Carol Burris of New York City’s South Side High School described the process in a Washington Post article titled “The scary way Common Core test ‘cut scores’ are selected”. One of the first steps in the process was the creation of a report requested by State Education Commissioner John King. 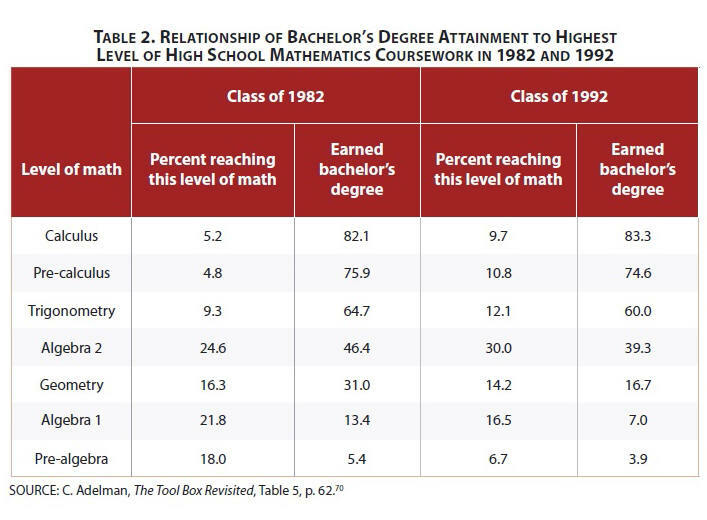 … The College Board was asked to correlate SAT scores with college grades to create probabilities of college success…. These SAT college readiness scores were then used to “inform” the selection of state test cut scores for grades three through eight. After coming up with three scores — 540 in math, 560 in reading and 530 in writing– the College Board determined the percentage of New York students who achieved those SAT scores. Those percentages were used to “inform” the cut score setting committee. As the committee went through questions, according to member Dr. Baldassarre-Hopkins, the SED helpers said, “If you put your bookmark on page X for level 3 [passing], it would be aligned with these data [referring to the college readiness data],” thus nudging the cut score where they wanted it to be. The state test cut scores that were ultimately selected align suspiciously close to the SAT college readiness scores. In a way, it makes sense. Common Core Standards were created to prepare students for college, so it could be argued that students now in grade school would be as poorly prepared for college as students who have recently taken the SAT. But the process seems to have been carried out backwards, without looking objectively at the test questions. Burris puts it this way. Here is the bottom line. There is no objective science by which we can predict future college readiness using grades 3-8 test scores. You can, at best make assumptions, based on correlations, with score thresholds that are capricious. To make college readiness predictions for 8-year-olds is absurd and unkind. I think you can assess whether an 8-year-old is on track for college readiness, but obviously with limited precision. However, I appreciate the point Burris makes. Moreover, considering the botched implementation of other aspects of CCS, I am inclined to be suspicious about the validity of the cut scores used in the New York state tests. A local newspaper reported that some committee members involved in selecting cut scores believed “the process was so tightly controlled that the results were inevitable”. Valerie Strauss, “The scary way Common Core test ‘cut scores’ are selected”, Washington Post, April 29, 2014. Gary Stern, “Common Core: Who’s on track for college and who is not?”, Lohud.com, July 27, 2014. E.D. Hirsch explains why “reading scores on standardized tests flatten out in 12th grade”. … “Reading ability is very topic dependent.” Given two passages of equal difficulty in syntax and vocabulary, the same reader will comprehend one better than the other if the reader knows something about the subject matter of the one and little about that of the other. The idea of a general reading ability that functions independently of what is read is “a misleading abstraction,” Hirsch says. If a reading test has ten passages with 8-10 questions on each, the same student will perform variably from one to the next depending on background knowledge. It’s an arbitrary system. If, by chance, you did volunteer clean-up work one summer and one of the passages concerns how cities and towns dispose of their trash, you will fly through it. A passage on a sport you never played, though, will slow you down, even though passage difficulty is the same. Here is the explanation for divergent trends among 4th– and 12th-graders. Passages for older students are more knowledge-intensive than those for younger students. Schools changed from a “knowledge intensive” curriculum to a “test-prep” curriculum. … A cumulative, knowledge-oriented curriculum will, over time, produce higher verbal abilities than a test-prep curriculum. Over 13 years of knowledge-intensive schooling, students, including disadvantaged ones, can learn quite a lot about a lot of topics, greatly increasing their ability to make high scores on a reading test, and making them ready for college or a career. Will Common Core Standards make a difference? The solution is simple, yet far-reaching. We need the reading curriculum to be more knowledge-aimed and less skill-based. Hirsch: “A cumulative knowledge-oriented curriculum will, over time, produce higher verbal abilities than a test-prep curriculum.” That means more set content and common readings in English, history, and civics, a sharper determination of “cultural literacy” (to use the title that made Hirsch famous), a narrower and more coherent curriculum. The biggest question seems to be how well CCS will be implemented. Among the many problematic issues surrounding CCS so far, there seems to be general agreement of a “botched” implementation. Mark Bauerlein, “The Test Score Solution”, Minding the Campus, October 15, 2013.